The final days of October are upon us and with that, the close of Archaeology Month in Pennsylvania. As part of our Archaeology Month programming we visited Cabela’s in Hamburg, Pennsylvania on Sunday, October 21st. 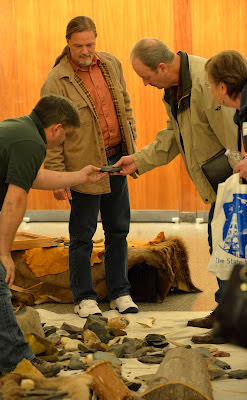 The public loves learning about archaeology and Native American prehistory. Our replica of a Native American dugout canoe is always an attention getter, and once again crowds flocked to sit in it for a Kodak moment. If you haven’t had a chance to visit an archaeological site somewhere across the commonwealth this month, don’t despair- our blog by county format has returned and you can catch up on a new county right now! We have returned to the topic of Pennsylvania’s archaeological tour of the counties which features a new county each week. This week we travel to Fulton County which encompasses an area of 438 square miles located in the south central region of our Commonwealth bordering the state of Maryland. 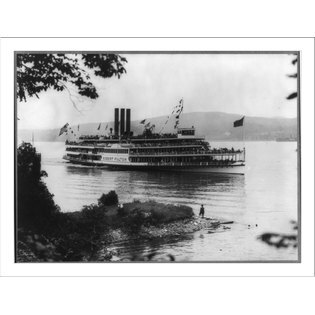 The county is named after Robert Fulton (1765-1816) an American engineer and inventor who was born near here. Perhaps best known for his development of the steamboat, he also designed the Nautilus, a working submarine for Napoleon Bonaparte. Robert Fulton was also an accomplished portrait and landscape artist and over the course of his life he was associated with such men as Ben Franklin, Benjamin West and Robert Livingston. Regarding the natural and archaeological facts of Fulton County, its physiography, hydrology and geology can be generally summarized as follows: Situated within the Appalachian Mountain Section of the Ridge and Valley Province the area is principally characterized by mountains and valleys that geologists have termed the Appalachian orogeny (325-260 million years ago). This event, in which the continents collided to form the super continent of Pangaea created the rugged Appalachian mountain range which extends from Maine to Alabama. Much of Fulton County is drained by the Tonoloway Creek, Licking Creek and Cove Creek sub-drainages. 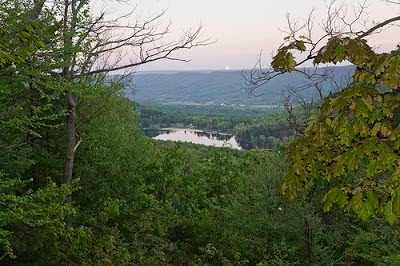 These and other smaller unnamed waterways to the south, west, north and east belong to the three larger watersheds to the immediate region – the Susquehanna, the Juniata and the Potomac. From an archaeological perspective Fulton County’s regional prehistory is defined by the context of these watersheds and the territory which they encompass. 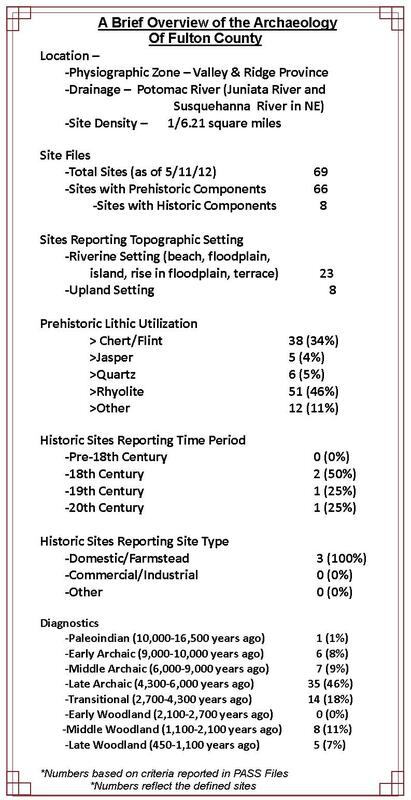 Reviewing the data base of recorded archaeological sites in the Pennsylvania Archaeological Site Survey (P.A.S.S.) 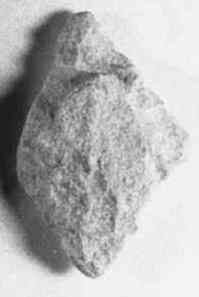 file for Fulton County, one finds that there is a rather diverse list of sites with associated chipped stone artifacts that range from the Late Paleo-Indian through the end of the Woodland period. 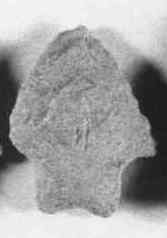 The archaeological survey completed under the Pennsylvania Regional Archaeology Program (Herbstritt 1982) revealed the following information. 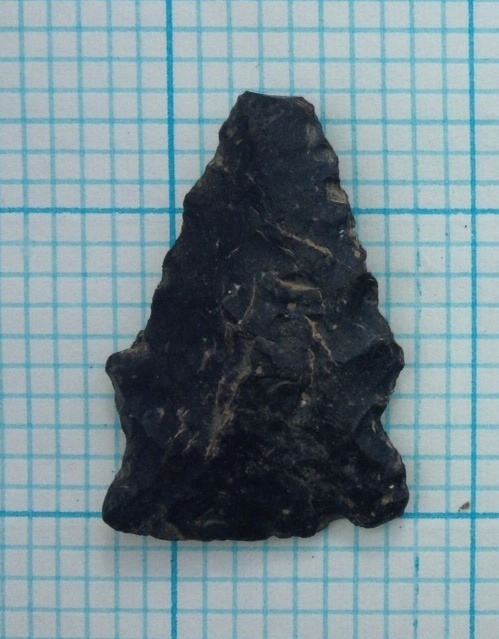 A Hardaway side notched point made from weathered rhyolite is reported from a site in the Big Cove Tannery drainage and at least 39 diagnostic points belonging to the Early Archaic period have been recovered from five sites. Recognized diagnostics include Kirk, MacCorkle, St. Albans,Lecroy and Kanawha and are generally made of rhyolite and chert. Moving on to the Middle Archaic period, Stanly and Otter Creek were the most frequently encountered types. 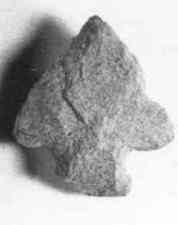 Again, like the Middle Archaic points, these were fashioned from South Mountain rhyolite and local cherts. Late Archaic styles include stemmed and notched types of the Vernon phase and the tentatively identified Bare Island type. Brewerton types are generally common, as well. Along with the broad spears of the Transitional-Archaic these are of South Mountain rhyolite. The Woodland period in Fulton County is represented by Early Woodland Orient-like fishtails, Rossville, Clagett and Hellgrammite points; ceramics are absent. The Middle Woodland Selby Bay or Fox Creek knife is prolific in the Fulton County area especially in the Big Cove Tannery and Licking Creek sub-drainages. Evidence of the Kipp Island phase is reported from four sites in Fulton County. Although few in number the fact that they have been found in such a remote region of the Middle Atlantic, is noteworthy. As for the Early Woodland period, ceramics have not been reported. There are four sites representative of the Late Woodland period and they are all located in the Licking Creek/Big Cove Tannery drainage. 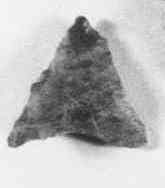 The sites are recognized by the presence of triangular points, however, only one of these sites have yielded limestone tempered ceramics of the Page Cordmarked type, a regional ceramic type indicative of the earlier end of the Late Woodland period. Few archaeological surveys have been done under Section 106 of the National Historic Preservation Act. However, a Phase 1 level archaeological survey ER#98-8056-057-B was completed on a proposed wetlands replacement location in Licking Creek Township south of Harrisonville, Fulton County (Raber and Heberling 1998). There, two prehistoric archaeological sites were identified and their locations are adjacent to Licking Creek. Shovel and auger testing completed during project recovered an isolated Dalton-Hardaway point made of jasper at one location and a hammer stone and nine pieces of chert at another nearby location. District 9-0 Pennsylvania Department of Transportation elected to avoid impacting the site with the creation of a wetlands area thereby avoiding any subsequent archaeological investigations in the area of potential affect. Few important Historic period sites are currently identified in Fulton County, Pennsylvania. The French and Indian War Period site of Fort Lyttleton, however, is considered among the sites that would justify archaeological testing to locate its actual location. Fort Lyttleton was begun by George Croghan in 1755 and garrisoned by provincials until the Forbes campaign in 1758. There are two nearby contemporary fort sites, Fort Loudoun in Franklin County and the recently discovered Fort Shirley in Huntingdon County. Information detailing the excavations at the latter site will be presented during the November 3rd Workshops in Archaeology in Harrisburg, so plan to attend! We hope you have enjoyed this brief introduction to Fulton County and its archaeological resources. These resources are Pennsylvania’s heritage and for all of us it is our window into the past. Please help us preserve these important resources by reporting and recording your archaeological finds while we all Preserve our Past for the Future. 1982 Prehistoric Archaeological Site Survey in Pennsylvania Region II with Emphasis on Fulton County Cultural Resources. Final Report submitted to the Pennsylvania Historical and Museum Commission. 1998 Phase I Archaeological Survey Proposed Wetland Replacement Area, Licking Creek Township, Fulton County, Pennsylvania. Report submitted by Heberling Associates, Inc., to District 9-0 Pennsylvania Department of Transportation and the Federal Highway Administration. 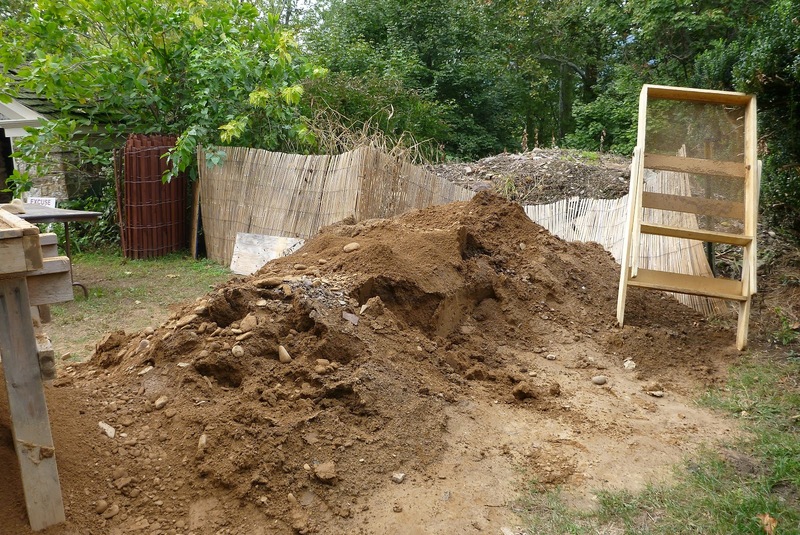 Final thoughts on this year’s excavation at Fort Hunter and upcoming activities of the Section of Archaeology, The State Museum of Pennsylvania. Closing shot from 2012 season- main excavation block. 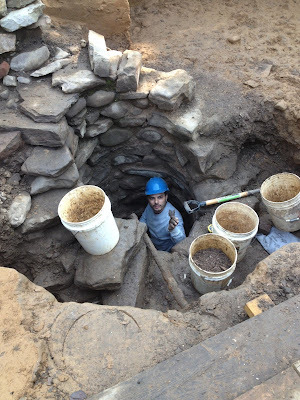 As reported last week in our blog, we tested the bottom of the well at Fort Hunter and it does not seem likely that it contains any remains from the French and Indian War period occupation. However, there continues to be an issue concerning why the icehouse, built by Colonel William McAllister during the early 1790’s, was built so close to the well. The southwest corner of this structure overlaps the well and this corner is also the location of some irregularly placed foundation stones that project from the foundation wall. In addition, there is a mysterious pile of rock that extends from the southwest corner of the icehouse even further over the well. One scenario to explain this positioning of the well and icehouse is that the well dates to the French and Indian War or earlier; Colonel McAllister was not aware of its existence 30 years later when he built the icehouse and accidently placed it along the edge of the well. The irregularly placed foundation stones and the mysterious pile of rock may represent a weakening or collapse of the corner and subsequent repair of the icehouse wall. Corner of icehouse, view of rock formation outside of wall and over well. Another view of these curiously overlapping features. An alternative scenario to this connection between these structures is that they were intentionally constructed in this manner by Colonel McAllister. There is some indication in his writings that he contemplated running a pipe from his well, through the icehouse and into his milk house to cool the milk. The juxtaposition of the well, rock pile and the icehouse may have been an innovative method to extend the preservation of milk for his dairy business. Linear featur in north end of excavation block. In another development at the end of last week, more 18th century ceramics were recovered from the area of a second linear feature at the north end of our excavation block at the edge of the bluff. 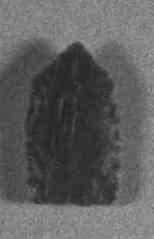 We have barely scraped the surface of this feature, however some probing suggests that it is at least 8 inches deep. Considering that only a five foot section has been exposed, a determination of its age or function will require opening adjacent five foot squares next year. Given its location on the edge of the bluff, some of this area has almost certainly eroded into the creek complicating the investigation. In an adjacent excavation unit to the southwest, there appears to be the corner of a stone foundation. In the 2013 season, both of these areas will be expanded to the east and west by ten or fifteen feet to evaluate their contents. Based on the topographic setting, and the cultural remains discovered thus far east of the mansion, it has been suspected that the area west of the mansion could also contain significant historic remains. However, little was found in the 1960’s excavation conducted by Robert Ditchburn and Duncan Campbell. We auger tested this area on the last day of the field season and discovered a very different soil profile compared to other areas around the mansion. In all three auger tests, we recovered prehistoric materials just below the humus level but this is followed by relatively coarse sand extending to a depth of approximately six feet. We will resume auger testing this area next year but the lack of historic remains continues to be surprising. In summary, the 2012 field season solved several problems and the results will be used to direct the 2013 field work. By completely excavating the prehistoric levels in the south half of the excavation block, we were able to more safely and easily excavate and auger to the bottom of the well. Based on the artifact content, the well was probably filled in one episode during the early 20th century when the mansion was hooked up to the public water system. Although, Early and Middle Archaic diagnostic artifacts have been recovered from disturbed historic strata, the earliest prehistoric remains in the block excavation date to early Late Archaic times. The excavation unit at the far north end of the block has produced a possible 18th century, French and Indian War feature. This and the adjacent undated rock foundation will be a major focus of the 2013 season. Augering between the mansion and the parking lot has continued to increase our understanding of the soil stratigraphy of the site and enabled the identification of areas that have been disturbed by cultural activity. These need to be investigated in 2013 and it is our hope that they represent the ditch or stockade surrounding Fort Hunter. Finally, October is Archaeology Month in Pennsylvania and many other states nationwide. We have several events planned. To see other events scheduled throughout the state click on http://www.archaeological.org/NAD/events. Crowds gather around the archaeology exhibits at Cabela's in Hamburg, Pa.
Sunday, October 21 – In partnership with the Society for Pennsylvania Archaeology, Inc. we will participate in public outreach event at the Cabela’s store located off of Interstate 78, at the Hamburg exit. Prehistoric artifacts will be on display along with our dugout canoe from the State Museum. 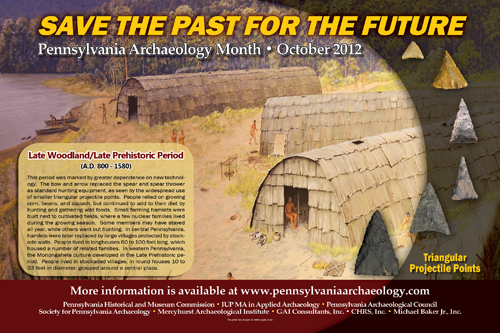 We will distribute literature on Pennsylvania Archaeology and answer questions from the public. This event has attracted approximately 3000 people in past years. Wednesday, October 31 – Archaeology Day at the State Capitol. In cooperation with the Pennsylvania Archaeological Council, the Section of Archaeology will have an information table in the East Rotunda. The goal is to share information with our legislators and publicize the importance of archaeological sites and the contribution of archaeological research to the citizens of Pennsylvania. Saturday, November 3 – The Annual Workshops in Archaeology Program at the State Museum. This is a day-long event for the interested public. The Archaeology of Penn’s Woods. The Archaeology Section of the State Museum of Pennsylvania invites all archaeology enthusiasts to attend the Annual Workshops in Archaeology Program on Saturday, November 3rd from 8:30 am to 6:00 pm at The State Museum of Pennsylvania, Third and North Streets, Harrisburg. Designed for the non-professional, this year’s program features a review of the archaeology of the Contact Period through the Revolutionary War Period. This time essentially covers the process of Native American and European interaction mainly through trade; the eventual displacement of Native American populations; the formation of European colonies; competition among the European powers for the control of resources; and finally the formation an independent nation. A huge amount of research has been conducted over the past 30 years and several new sites have been discovered. There will be three presentations on Native American culture during the Contact Period, two presentations on Native American and European interaction, two on the French and Indian War and one on the Revolutionary War. In addition there will be a flint knapping demonstration, French & Indian War/Revolutionary War re-enactors, and an artifact identification session. The Bureau for Historic Preservation will provide information and assistance in recording archaeological sites which is essential for protecting and preserving our archaeological heritage. Closing comments from Stephen G. Warfel will summarize the workshop sessions and reflect on this significant period in Pennsylvania history. The workshops will be followed by a reception in the Anthropology and Archaeology Gallery of The State Museum where the audience can interact with the presenters. Flint knapper Steve Nissly with a workshop participant. A pre-registration fee of $20.00 per person (required by October 31st), $15.00 for students; $15.00 for Heritage Society, SPA and PAC members covers the entire day. Registration at the door is $25.00. Pre-registration is strongly encouraged. Included in registration are nine presentations in the auditorium, a morning and afternoon coffee break and a closing reception. Lunch is on your own. For more information call 717-783-9926 and click on the sidebar link for the 2012 Annual Workshops Program and registration form. Visitors to our blog for the past month or so have followed our archaeological investigation at Fort Hunter Mansion and Park where we have been searching for evidence of a French and Indian War period fort. This is our last full week at the site (36Da159) which will soon be covered and secured for another year. We have been able to share our enthusiasm for the investigation with a steady stream of visitors to the site and some of them have come back to volunteer with the excavation. Many young visitors stared in awe at the exposed well and mounds of dirt. Hopefully, all were left with a new appreciation for archaeology and the heritage of our past. Screened soil which will be used to backfill part of the excavation block. The investigation of the well was wrapped up this week. The bottom of the well was at 35.83 BD (below datum). The soil matrix was the same - ash and cinders - for the bottom 26 feet and the artifacts were all late 19th and early 20th century in age. We recovered parts of an oil lamp spread out between 12 and 15 feet in the well suggesting that it was filled rather quickly. If this well was associated with the fort and any fort related materials were discarded into it, we believe those materials were probably cleaned out when Colonel McAllister made improvements to the property beginning in the late 1780’s. Stones jutting out fron corner of the ice house, upper left side of photo. The rocks that seem to be an extension of the icehouse over the well will be investigated at the end of the week. There are various theories as to their function and we would like to investigate them further to resolve those questions. Earthen fill exposed on back side of builders trench for well. We continue to be impressed with the size of the well pit and the complexity of its design. The well shaft is 32-34 inches in diameter and the large cobbles forming the shaft are about 18 inches wide. Behind the cobbles is a 15 inch wide layer of packed pebbles. This week we discovered that the pebbles are supported by a layer of earthen fill about 12 inches wide. Digging the well did not simply involved excavating a hole large enough to hold the cobbles lining the shaft but in fact started with a hole 10 – 11 feet wide and up to 35 feet deep. This amounts to 3,324 cubic feet or 123 tons of rock and soil – all removed by hand. Excavated feature No. 63 in north end of block. Tin glaze ceramics and a gun flint were recovered from a linear feature in the northern most unit of our excavation block. Although it mostly contains 19th century artifacts, there may be other features in this area that date to the 18th century. This will be an area that we would like to potentially investigate in 2013. Front yard feature, possible road/ditch. We are continuing to investigate a road/ditch-like feature in the front yard. This feature was initially identified in 2010 and additional testing in the area will continue next year. We are finished with our excavation this Friday. Plans for covering the site include backfilling the southern portion of the excavation block and shoring the walls of the northern section. The well will be partially backfilled but remain open for one more year in order to continue our investigation of its construction. It also facilitates drainage in the excavation block. Our excavations are coming to an end for this year, but the investigation will continue for months to come. The artifacts will be washed, labeled, identified, inventoried and researched. The field maps will be digitized and compared with prior year’s maps to search for patterns which might indicate stockade lines, or additional features. The photographs will be cataloged and paper documentation organized and filed for another year; preserving our findings for future archaeological research. Analysis and comparison of the recovered artifacts with those from other French and Indian War period sites, which have undergone archaeological investigations, will help us to formulate a plan for next year’s investigation. All of our followers know that TWIPA stands for This Week in Pennsylvania Archaeology, but since we have been consumed with our excavations at Fort Hunter, it seems appropriate that for at least one more week our blog is TWIFHA- somehow this just doesn't work as well as TWIPA, but here is the latest on our escapades. Feature which we now believe is the corner of a foundation. Excavations continued this week at Fort Hunter and with only one day lost to rain we were able to make some headway on our main objectives this year – the well and the feature/soil anomaly in the front yard. The damp drizzle this week, while somewhat of a hindrance, allowed for soil stains to “pop” or stand out in some of the units as was the case in unit N90 W10, on the north side of the well. We have been investigating a line of rocks in the northwest corner of the excavation block and this week discovered that it makes a right angle turn to the west. We are now feeling pretty confident that it represents some type of structure (Initially, it was felt that it represented a French drain or wall). On the "inside" of this structure, quantities of coal and mortar were recovered from what appears to be a level floor. Understanding the age and function of this structure will require opening additional units next year. Fartherest north unit in excavation block on the edge of the bank above Fishing Creek..
Also on the north side of the well, we expanded our excavation block another five feet to the edge of the bluff overlooking Fishing Creek. This is unit N95W5 and it is east and north of the previously noted unit. Feature 45 extends into this unit from N90W5. This feature produced ceramics, glass, nails and mortar from the 19th and 20th century but there were no stockade posts or fort related artifacts recovered. Further to the south, in N80W5, level 4 in the prehistoric occupation was removed. South of the well, this level produced Late Archaic artifacts including bipolar cores used in lithic reduction. This area will provide additional data on this time period and hopefully more on lithic technology. Moving further to the south brings us to the well. We are currently 13.24 feet below datum (BD) in the well shaft. We are working towards our goal of 16 feet BD. For those of you unfamiliar with archaeological excavation methods, the datum is an arbitrarily determined point from which all vertical measurements are taken. This datum point is important in establishing arbitrary levels and in recording the natural and cultural stratigraphy of the site. On of our regular volunteers, Phil, in the well. Last year large rocks were encountered at this level which blocked our ability to auger (drill) to the bottom of the well. In order to evaluate the potential for recovering 18th century artifacts, we need to get below this level. Assuming we have about three days of good weather and sufficient volunteers, we should be able to remove the large rocks and begin augering to the bottom by Tuesday or Wednesday of next week. Augering the front yard, North Street is behind Jerry in this photo. Every once in a while something happens that makes even the "old guys" give pause. 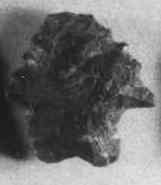 This black chet point was recovered in the auger test at S180 E20 at 4.78 BD which is 2.4 feet below surface. 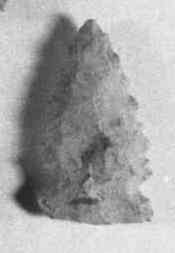 This Brewerton side-notched-like point likely dates 5,000 years ago to the Late Archaic period. We began augering in the front yard to develop a more compressive understanding of the stratigraphy. Two years ago we identified what appears to be a ditch or road in this area but soil scientists argued that it was a natural profile. Based on the results of this week’s testing, it appears that this anomaly has a limited horizontal distribution (and therefore probably cultural in origin) and may well represent the ditch surrounding the fort or a road leading to the fort. We will continue augering next week in order to better map this feature. Dr. Kurt Carr at Indian Festival Day demonstrating the proper technique for launching an atlatl. This Sunday, October 7th, is the Pennsylvania Indian Festival at Fort Hunter Mansion and Park . These is our last big public event during our field work season so if you haven’t stopped by yet, please take the time to come over to the site. Visitors are always amazed at the information we share with them and the observance that “all of this is just below our feet”. Other activities scheduled for the day include an opportunity to launch a spear using an atlatl. The atlatl, or spear thrower, was used by Native Americans more than 9000 years ago to hunt animals such as elk, bear and deer. Dr. Kurt Carr from The State Museum will be on hand to demonstrate and instruct participants in the proper form and technique. The forecast of cool temps on Sunday will be perfect for a bowl of warm venison stew and corn bread. Steve Nissly discusses flint knapping with 2011 Archaeology Workshops participants. Remember the Workshops in Archaeology program is less than a month from now, November 3rd. The 2012 Annual Workshops link on the upper right side of this blog will provide you with a registration form and program. Mark your calendar and send in your registration form for this daylong event that is sure to offer participants an opportunity to learn more about the struggle which ensued in Pennsylvania during this time of contact, settlement and eventually colonization. This program will appeal to both historians and archaeology enthusiasts as we explore both the historic documents and the archaeological evidence for these events in the commonwealth. Archaeologists are examining these important sites in an attempt to better understand this volatile period and the role that citizens some 250 years ago played in the colonization process. We hope you can join us at one of these events and be sure to check the Society for Pennsylvania Archaeology web site for additional events held throughout the month of October for Archaeology Month. Annual Archaeology Month Poster, October 2012.